Ogma's Tale Of The Trees is the first of my Tree Trailogy of books and music recordings ... which includes the word Trai, pronounced something between 'tree' and 'tri' as said in trilogy, and it means enchantment. Who of us finds enchantment from trees? Who of us find trees inspire us with intuition, inspiration and even divination? 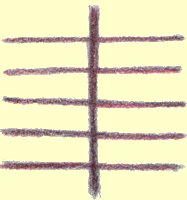 There is a growing use in using Ogham symbols as a tool of divination though many use the symbols as the starting point. Here with Ogma's Tale |Of The Trees I use the intuition of vibrations that inspire us to make sounds, then eventually to serve an archived memory of trees, the Ogham alphabet came along. and hold one another thoughout this land ..."
This is what I feel the legend of Ogma to Ogham was and isabout. through understanding there is no beginning or end!